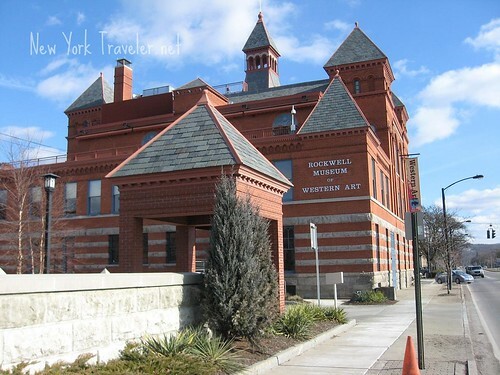 After our trip to the Corning Museum of Glass, we meandered our way down the streets to the beautiful Rockwell Museum of Art. 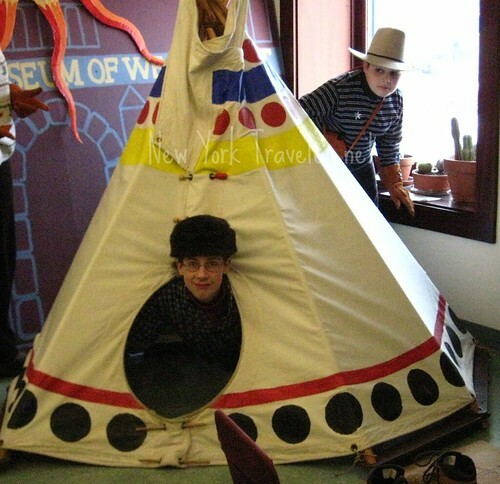 On our way there, we realized that at one time, the wilds of New York State were once considered “the West”! Land west of the Hudson was considered “dangerous frontier” full of “wild savages” and harsh terrain before the French and Indian War (1754). Because we Mecombers are history students, we’ve studied the diaries and narratives of frontiersman and explorers. And who can forget the havoc wreaked on General Johnny Burgoyne, during the American Revolution, as he and his army tried to hack a path through the intimidating primeval forests of Saratoga, NY? How the “rednecks” of Upstate New York chopped trees, broke rivers to make swamps, and haunted the British armies with nightly coyote howls, all to thwart the British conquest of the colonies? The “west” in America is quite relative. With that said, this museum is about the hootin’ tootin’ cowboys and cattlemen of the continental southwest. 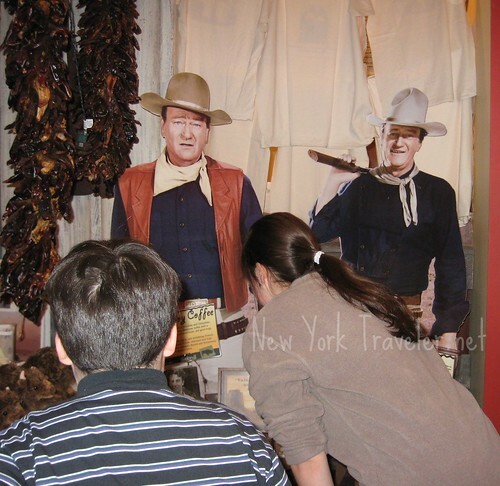 My kids adore everything western, so they were overjoyed to visit the Rockwell Museum of Western Art. The building is quite beautiful, and the area surrounding the building is elegant and neat. The building was once Corning’s City Hall and fire station, built in 1893. It is Romanesque Revival architecture. As with the Corning Museum of Glass, this building suffered the anger of Hurricane Agnes in 1972. Much of the building was restored or rebuilt, and has been placed on the National Register of Historic Places. The interior is wonderfully designed and decorated. Natural wood and contemporary wall colors really give it a designer’s punch. I love the style of the building, inside and out. The Museum originally was a collection of various antiques and collectibles, especially old toys and gadgets. In the year 2000, the museum’s contents were reorganized around its fine collection of western and Native American art. I’m no fan of looking at terracotta pottery, but the pieces here were genuinely beautiful and interesting. Unfortunately, because the Museum prohibits photography, my photos are very limited to the gift shop and kids’ area (which were quite interesting, too). 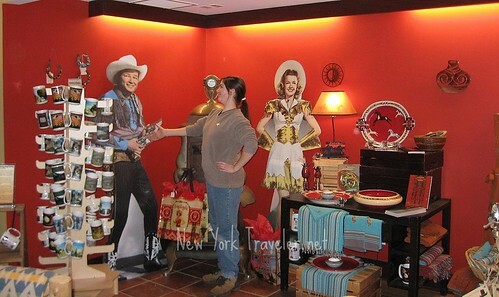 Here is Injane- a Western aficionado if there ever was– greeting Roy Rogers and Dale Evans. Checking out John Wayne’s Cowboy Coffee. 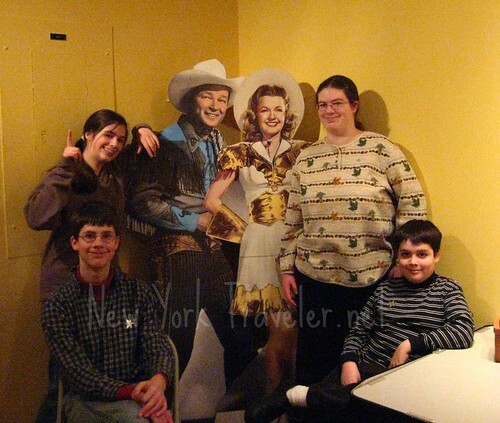 I won’t go on about how my kids are absolutely nuts about Roy Rogers, John Wayne, and Daniel Boone. Suffice it to say that they want to skin squirrels and ride broncos. At home, we have dozens of toy Kentucky rifles, coonskin hats, bandanas… and et al. This was neat– a “lady’s Deringer.” Such a tiny thing– that’s a business-sized display card there. We did wonder how it worked. I suppose tiny bullets for such a tiny gun. But it seemed that a shot out of that gun would feel more like a fly swat than a bullet hit. No wonder ladies in all those Western movies cried a lot. I reckon I’d cry too with such a useless little pistol. It took us about an hour and a half to go through the Museum. It is a very kid-friendly museum, so we loved every minute of it. The kids were offered a backpack full of goodies to aid on a scavenger hunt. 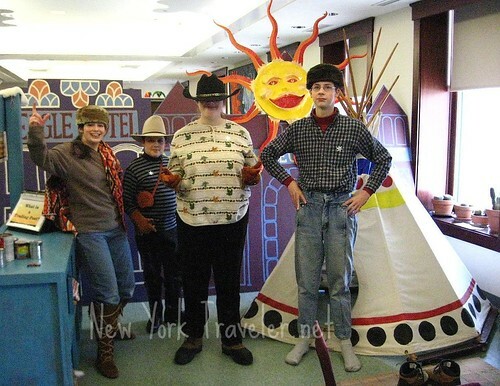 And on the second floor, there was a kids’ play area with dress-up clothing, a Western town, and all the props. Here’s the sheriff, checking out the vittles (this was before the USDA, ya know). 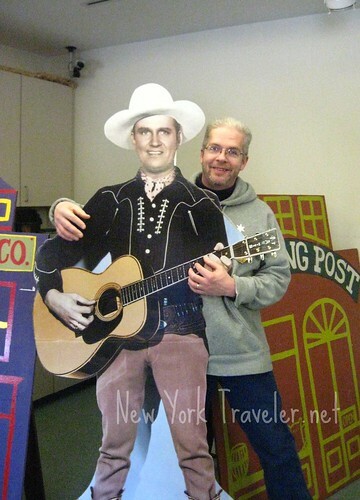 Even the husband couldn’t resist helping Gene Autry out with a rousing rendition of “Ghost Riders in the Sky.” It’s strangely uncanny, but for weeks Mr. M has been hooked on that song, playing it over and over and over on hs guitar. Roy and Dale joined us upstairs in the Kid’s Area for a crayon-coloring contest and some virtual beans and bacon. Like I said, I couldn’t get any photos of the art or displays. How I wish I could have! We saw Remington sculptures, paintings, a genuine Sioux headdress, tomahawks, a grand collection of rifles, and much more. The Museum’s website does have some photographs of their collections. The most stunning displays, in my opinion, were the real-life stuffed buffalo head hanging on the wall, and an original Indian buckskin outfit. The buffalo head was enormous. It was huge. I can’t even begin to express my astonishment at the size of the beast– and this one was only two years old! You could easily lay down and take a nap on the beast’s head. The Indian outfit was amazing to me because it was so large. I’ve been to numerous museums and am accustomed to seeing much smaller-sized clothing of people in the “olden” days. The Indian who wore this outfit was the size of a professional football player– wide as a refrigerator. Maybe even wider! He wasn’t much taller than 5’8′, however. Big guy! My daughters informed me that in some historical accounts (including one of their favorite primary sources– the Diary of Joseph Plumb Martin), the settlers did remark at how big and strong the native people were. I did not know this! It was quite a shock! After investigating all that could be investigated, we relaxed in the lounge before heading out. The lounge is a beautiful room done in Craftsman-style design. The leather Adirondack-style chairs made from logs were so comfortable that I could have taken a snooze. A bright red Navajo cloth rug made the room very comfortable. After a brief recess, we reluctantly gathered up our spurs and made moves to ship our saddles back home. 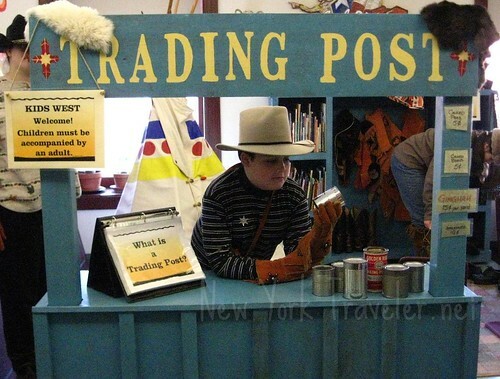 The Rockwell Museum of Western Art was given a “thumbs up” from the Mecomber kids. Their admission was free, too! I highly recommend visiting this little gem in Corning, NY. hi.. i came across your wonderful description of the rockwell museum of western art.. tho i now live in an old quaker mill town outside of baltimore.. my heart is still and will always be in corning.. my mom’s father came from france to live and work in corning from 1910 to til his death in 1977.. my like-a mother aunt and my uncle woked at cgw from high school until they retired. 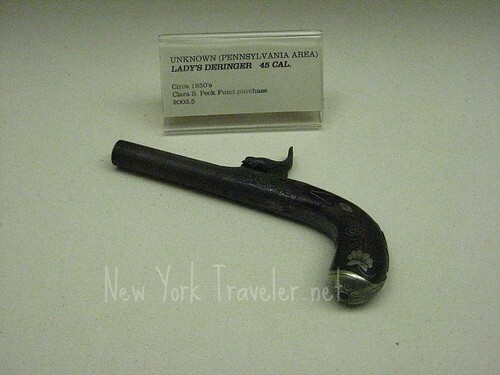 they loved corning with a passion until their recent passings. i am so glad you came to corning and that i found your pictures and write-up..
from 1948 until 2007, corning was my home away from home..
but when i left i didn’t take corning pictures..
i would love it, if you would email me the pic of the museum that you posted above.. i will get it developed and add it to the album i am making of my aunt and uncle’s life. Hi Cathy– wow that is neat! I’ll be sending you an email.